Paducah's City Hall is located at 300 South 5th Street. The building and grounds, which encompass a city block, are accessible with a ramp on the South 5th Street entrance and an elevator. The building has three levels (two main floors and a basement). The first floor contains the Finance Department, Human Resources, Fire Prevention Division, Human Rights Commission, and the Paducah Ambassadors. The second floor houses the General Government Department which includes offices for the Mayor, City Manager, City Clerk, and Public Information Officer. Also on the second floor are the Engineering-Public Works Department, Planning Department, Section 8 Housing, and the City Commission Chambers and Conference Room. The basement houses meeting and storage space in addition to mechanical components. Visit City Hall Project to learn more about the rehabilitation project that began in 2018. Authorized by the National Historic Preservation Act of 1966, the National Register of Historic Places is part of a national program to coordinate and support public and private efforts to identify, evaluate, and protect America's historic and archeological resources. Referred to as a “shrine to Democracy” the building symbolizes the prevailing will of the citizens of Paducah and three administrations committed to renewal and economic resurgence of the City. The building became the face and new image of the city and a symbol of progress under Paducah’s Local Urban Renewal Program and the Federal Capital Grant Program for Urban Renewal under Title I. With the design of an internationally known architect, and the most prominent representation of New Formalism design in the city of Paducah, the property is also architecturally significant evaluated within the historic context of New Formalism Architecture in Paducah, Kentucky 1960-1965. The building resulted from a highly successful collaboration between a prominent architect and a City determined to express its distinct identity through a landmark civic building. The building’s striking design-employing the classical symmetry, colonnaded portico and geometric elements-displays Paducah’s most accomplished instance of New Formalist design. The Period of Significance begins in 1963, the original construction date and runs until 1965, when the building’s construction was complete. The property’s significant period continues to contribute to the architectural environment of the City of Paducah as an unprecedented local architectural monument and a symbol of mid-century progressive movement within local government into the present. In 1962, the Fantus Plan adopted by City and County governments called for creation of new image of Paducah by upgrading it physically, economically, socially, and culturally. In the plan, “A new, well-planned, well-designed city hall will be a symbol of Paducah’s economic resurgence. It will be an indication to citizens and visitors alike that something new is happening in Paducah. The psychological effects of such a new building, having good land-use planning, and architectural design, will be of considerable value in changing Paducah’s image from that of just another Ohio River town to that of a community which has taken hold of its problems and is working toward their solution." Also in the early 1960’s, the Paducah McCracken Development Council proposed a new City Hall as part of a federally funded urban renewal project. The council asked Paducah architect Lee Potter Smith to suggest a prominent architect for the design. Paducah's City Hall was designed by world famous architect Edward Durell Stone and constructed by local contractors. Stone flew into Paducah in 1963 carrying a scale model of City Hall. Stone also designed the John F. Kennedy Center for the Performing Arts in Washington, D.C. (opened in 1971), the U.S. Pavilion for the Brussels World's Fair (opened in 1958), and the U.S. Embassy in New Delhi, India (opened in 1959). Each of these buildings has features that resemble Paducah's City Hall. City Hall was built beginning in 1963 during the administration of Mayor Robert Cherry (1960-1964) and dedicated during Mayor Tom Wilson’s administration (1964-1968). The dedication of City Hall was held February 28, 1965. The Police Department also moved into the basement of the building that month. The Police Department now is located at 1400 Broadway. 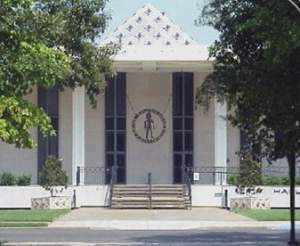 Paducah's City Hall is a concrete structure covered by stone. It has unique features including large exterior columns. The lighting around the exterior of the building makes City Hall appear like it's floating. The top of the building has a pyramid-shaped "lantern" that points 20 feet toward the sky (40 feet above the ground level). The exterior is a graceful blend of old South, modern, and classical styling with the columns more of a Graeco-Roman era and Southern Colonial. The eaves provide a large shaded porch that protects the windows from direct sunlight. The cantilevered porch prevents heating and cooling units from being on the roof. Inside City Hall, the emphasis is on lighting and openness with no dark hallways. The inner court (atrium) is a 60-foot square with a sunken fountain. The fountain area now holds greenery. The atrium used to have orange swivel chairs and marble-top coffee tables. The offices are on the exterior walls of the building to take advantage of the windows and the atrium area. Stone also proposed a plaza with a fountain to link City Hall, the McCracken County Courthouse and the McCracken County Library. In 1970, landscape architects Scruggs and Hammonds designed the plaza. It was later named for former Mayor Dolly McNutt. Dolly McNutt Memorial Plaza has a fountain, monuments, benches, tables, free wireless internet, and landscaping. In the lobby of City Hall at the South 5th Street entrance is a large phosphor bronze bell. The bell which weighs 3500 pounds was constructed in 1883. Inscribed on the bell is "The Jones, Troy Bell Foundry Co. Troy, NY 1883". It sounded each hour on the clock tower on Paducah's City Hall when it was located on 4th Street at Kentucky (332 Kentucky) from 1883-1966. The building was razed in 1983, and the bell was found in three pieces in the ashes. In 1986, Mr. Beasley of Beasley Monument Company offered to keep the bell on his property. One night a motorist missed a curve and smashed into the bell breaking it into several more pieces. In 1989, Mayor Gerry Montgomery sought help in restoring the bell. VMV Enterprises donated 330 man hours and put the bell back together. Work, including mounting the phosphor bronze bell on marble, was completed on October 31, 1991. The bell was dedicated on January 5, 1992. It was later placed in City Hall where it is housed today. On the plaque above the bell the following are recognized for their participation in the restoration of the bell: Beasley Monument Company; Falconite, Inc.; Iron Workers Local Union Number 782; Jones Glass Company, Inc.; Paducah Life Member Club of the Telephone Pioneers of America; Peck Flannery Gream Warren, Inc.; VMW Enterprises; Welders Supply, Inc.; and the City of Paducah.